Are the Navy’s safety boots unsafe? At least three years ago, senior Navy leaders came to believe that the boots you’re wearing might cause you to fall off a ladder, and no one told you, according to internal files leaked to Navy Times. “We are working closely with the Naval Safety Center and we know there’s a potential issue and we’re working hard to fix it,” said Amy Brayshaw, the supervisory textile technologist at the Navy’s Organizational and Protective Clothing Group, in a telephone interview with Navy Times. Growing fears about how safe the Navy’s safety boots are when worn on ships can be traced to a series of internal messages exchanged in 2016 at the highest levels of the service. “The Naval Safety Center has witnessed a sharp increase in the number of mishaps and lost work days in the fleet as a result of sailors falling while on ladders. This trend began with the transition of footwear from the old boondocker-style footwear to the new NWU-style boot,” wrote Rear Adm. Christopher Murray, then the director of the Naval Safety Center, in an April 15, 2016 email to the office of the Chief of Naval Operations, Navy Exchange Service Command and other Navy leaders across the globe. Murray and others at the Norfolk-based command were eyeing a stream of injury data that showed an alarming and sudden rise in ladder well injuries. 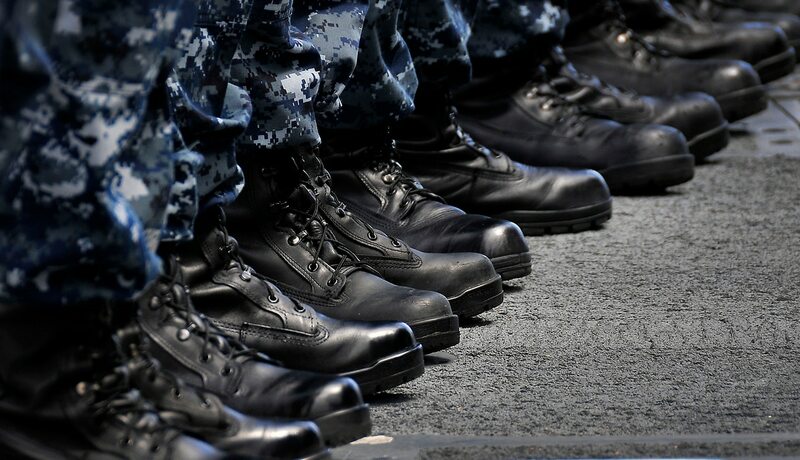 The rash of mishaps began in 2010, two years after the service began introducing new general-purpose safety boots to pair with the Type I “Blueberry” Navy Working Uniform, according to the internal files. Sailors had been ordered to swap out their old 6-inch low-rise chukka-style boondockers for the new 9-inch NWU boots by Dec. 31, 2010. Between fiscal years 2005 and 2009, the Navy recorded 274 ladder mishaps, about 55 per year, according to charts obtained by Navy Times. 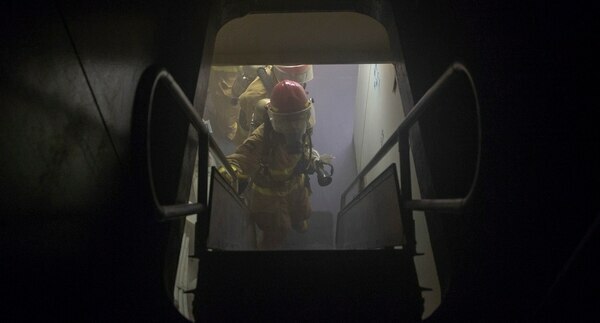 In late 2008 and the bulk of 2009, when the transition to the new boots began, there were 38 ladder spills across the Navy that resulted in injuries. But that figure skyrocketed to 150 the following year during the NWU boot rollout and never ebbed. Between 2010 and 2015, researchers counted 1,339 more ladder fall injuries, an average of more than 233 mishaps per year. Over that five-year span, the Navy notched 13,800 lost work days, 4,300 days on light or limited duty, and 500 days of hospitalization – the largest adverse impact on the fleet of all reportable injuries, according to the records. 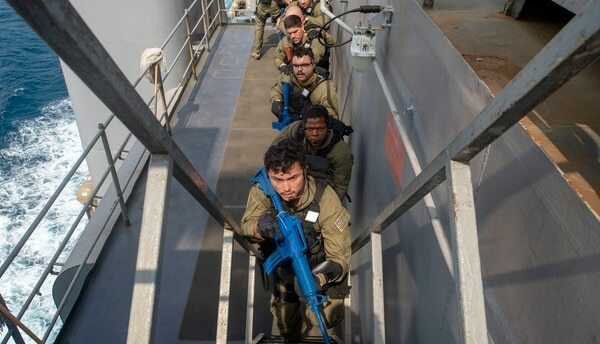 Sailors climb a ladder well during visit, board, search and seizure training on board the amphibious dock landing ship Fort McHenry on Jan. 20. The Navy began debating possible links between issued safety boots and ladder well injuries in 2016, according to documents leaked to Navy Times. (Mass Communication Specialist 3rd Class Chris Roys/Navy). In a 2016 warning to admirals worldwide, Murray said that his analysts considered three possible reasons for the rapid rise in accidents: ladders, sailors and footwear. “Since there has been no significant change in the construction of ladders used aboard ships and submarines or the manner in which sailors transition up and down ladders in the last 10 years, the focus turned to the boots our sailors are wearing,” wrote Murray, who retired in June of 2017. Murray urged superiors to order a new round of testing on NWU boots, including examining how well the new footwear performed on wet, oily or fuel-splashed surfaces compared to the old boondockers. Murray also wanted to compare how NWU boots performed against civilian brands like Red Wing that already were approved by the federal Occupational Safety and Health Administration. Murray’s third request asked the Navy to determine if heel and toe protrusion on the new boots or possible problems with flexibility affected how sailors move up and down ladders at sea. That stemmed from fears voiced by Mark Geiger, then-coordinator for Acquisition Safety at the Naval Safety Center’s Afloat Safety Programs. Murray urged his fellow admirals to order testing “without delay” but it never occurred in 2016. Reached by Navy Times, Murray declined comment. Geiger did not return messages seeking comment. Inside the Naval Safety Center, Murray and his team of researchers already had reached more damning conclusions about how the Navy’s boots were tied to ladder well injuries, according to other files slipped to Navy Times. His researchers discovered that the Navy neither requested the slip-resistance test nor was one completed by the manufacturer, according to the report. Murray’s concerns were buttressed by a March 15, 2016 email written by Brian J. Hamilton, then the textile technologist running the Navy Footwear Program at the Navy Clothing and Textile Research Facility in Natick, Massachusetts. Hamilton left the Navy program in early 2017 to become a senior manager at Reebok Future in Massachusetts. He did not return multiple messages seeking comment from Navy Times. In a 2016 message circulated to the CNO and senior service leaders worldwide, officials at the Navy Exchange Service Command Enterprise acknowledged growing concerns about oil and slip problems with the NWU boot, plus how its size and the design of its heel and toe might cause sailors to fall off ladders. But NEXCOM never tested the NWU boot sole because it was the same used for the 6-inch footwear it replaced, the officials said. Instead, they started “researching the evaluation, testing and requirements that were used during the development of the 6-inch boot,” NEXCOM officials wrote. To determine if the condition of the new boot’s soles might be causing the ladder well mishaps, the Naval Safety Center sent out a second circular in late 2016 asking commanders to include details about the footwear worn during future accidents, such as if the sole was old, frayed or new. For the next year, the Naval Safety Center compiled the fresh data and released a second report about ladder falls on April 9, 2018. The new analysis noted that the injury trends highlighted in the initial 2016 study never abated. 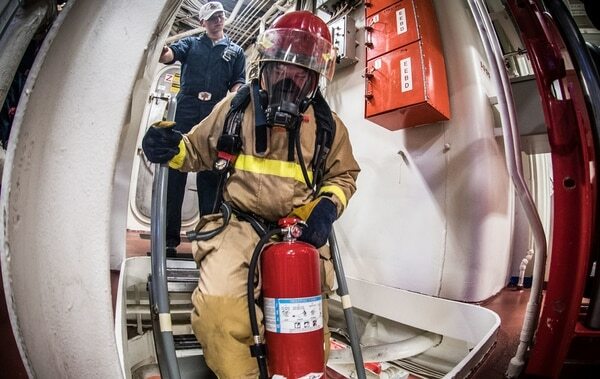 Ladder mishaps now comprised 14.4 percent of all personnel injuries and 22.5 percent of lost or affected work days on surface ships and submarines. That amounted to 4,000 affected work days, including 36 days of hospitalization, 650 days of lost work and 3,282 days of light, limited or restricted duty over that year. But the Center could find no correlation between the condition of the injured sailors’ boot soles and their ladder injuries. Instead of calling for changes to the boot’s design or a switch to OSHA-certified brands, Center officials indicated that “most ladder injuries were preventable and were the direct result of personnel errors in judgement and spatial awareness,” according to the 2018 report. “The only effective way to reduce these injuries is for commands to conduct effective hazard awareness training and enforce safety standards on ladders,” it said. In the wake of the 2018 report, however, the Center released an ALSAFE advisory and submitted a Navy Lessons Learned “to warn the fleet about the risks that cause falls in ladder wells, which include running, carrying heavy objects and not utilizing the hand rail,” Jones said. Despite persistent concerns about the safety of the NWU uniform’s general-purpose boot, the Navy never quit issuing it at boot camp and NEXCOM continues to sell it in uniform shops. 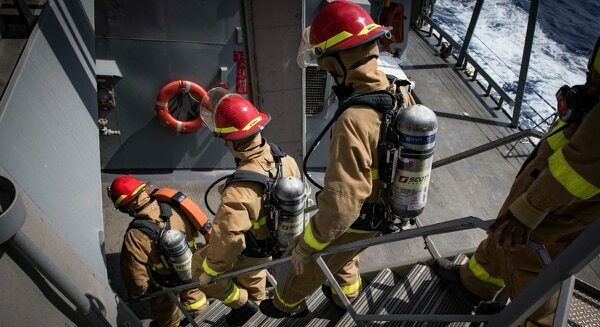 The Navy is developing replacement footwear that can be worn on warships, submarines and flight decks, however, and recently introduced an optional “I Boot-4” for sailors to purchase. Although officials insist it has “increased resistance” to slips, they have not elaborated on the sole’s design and it does not appear to have radically changed from the issued safety boot. The I Boot-4 also isn’t approved for wear on flight decks because the sole picks up bits of debris that can get sucked into jet engines, causing “Foreign Object Damage,” or FOD. Before its October launch, internal messages provided to Navy Times revealed that officials remained concerned about the soles of the new I Boot-4 on ladders at sea. “Has this new boot been through all required testing? If it has, can you pass a positive email stating this so we can close out our tracking. Thank you,” he wrote. In the three months since the new I Boot-4 hit the Navy Exchange's shelves, it accounts for only about 12 percent of sea safety boot sales. NEXCOM spokeswoman Courtney L. Williams said that Brayshaw’s Navy Clothing and Textile Research Facility will continue to use the issued 9-inch general-purpose safety boot as a “baseline” for comparisons to off-the-shelf footwear and new prototypes developed by the service for the Navy’s next boot. The Navy has announced no deadline for when the service will issue the new boot.